The Ford Focus X-Road wears tough fender arches, special front and rear treatments, and an aluminum skid-plate. The bad news: There are only 300 for the Dutch market. Worse news: It's an appearance-only package. With a name like "X-Road" we were getting all hot and bothered at the prospect of an all-wheel drive, safari-driving Focus, but such is not the case. The car maintains its standard front wheel drive and 125 HP 1.8 liter inline four. Not to say we still don't want the Euro-spec Focus here in the US, but this being just an appearance package with no new hardware lessens the pain of knowing there will only be 300 built and they're all destined to live in the Netherlands. If you're planning on hitting Amsterdam's AutoRAI, expect to see the car unveiled in the Ford booth. The new Focus X Road is a tough, striking Ford, based on the very well-equipped Focus Wagon Titanium. The X Road differs from the regular Focus by its robust sturdy black bodykit with front and rear bumpers and the black finish of the doors and side panels. These limited edition produced Focus X Road is powered by the 1.8-liter 125-hp engine and transmission on regular unleaded petrol and bio-ethanol can run. The Ford Focus X Road is a special, limited version of the sturdy and robust nature of the Focus more highlights. With its special bodykit with 'off-road look distinguishes it clearly from the normal Focus. The attractive 17 "alloy rims and black dakrelings to in Moondust Silver metaallak sprayed X Road fully. 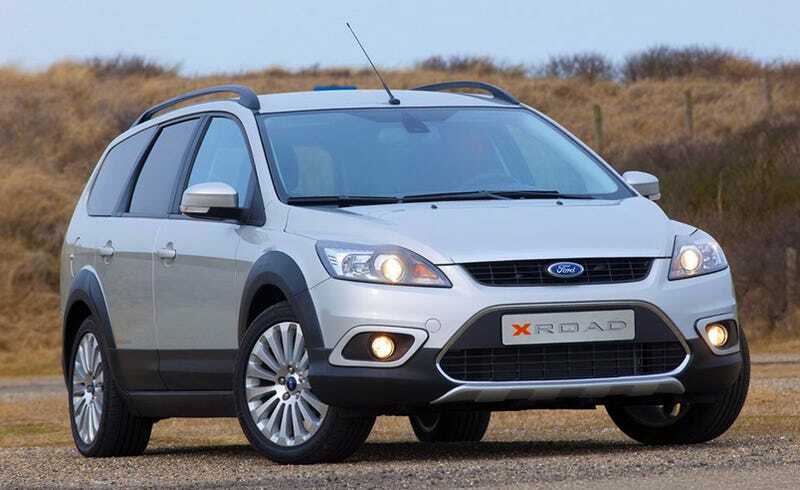 The Focus X Road has a sturdy and striking appearance, but is also fully equipped. The X Road is based on the implementation and Titanium offers another DEATC (separate automatic air conditioning), electric controlled window around, electric windshield heat, rain sensor, automatic dimmende interior, automatic switching of dipped headlamps, electrically operated and heated exterior equipment, sports front seats, cruise control and an audio system with CD player and AUX jack. At an additional cost of only € 500, - is the Focus X Road to provide an interesting Business Pack, consisting of an advanced navigation system with 5-inch color display, USB connector, Bluetooth phone for hands-free phones and voice-control operation of the phone, the navigation system, air conditioning and audio system. The Focus X Road makes its robust appearance where powerful and vivid performance. This sturdy Focus is powered by the familiar 1.8-liter 125-hp engine and transmission on regular unleaded petrol and bio-ethanol can run. The Ford Focus X Road is a green energy B. The Ford Focus X Road is experiencing his Dutch debut during the AutoRAI and is produced in a limited edition of 300 pieces. This Ford is in mid-July in the Netherlands showrooms for the very competitive starting price of € 25,175, - including VAT and BPM.